❑ 90 minutes of party time. 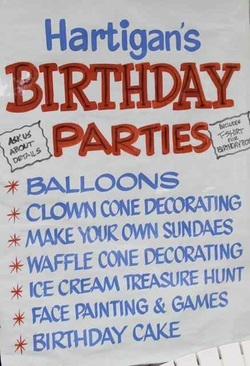 ❑ Choice of 3 activities, games, prizes, ice cream cake & Hartigan's t-shirt for birthday child. ❑ 1 - 2 employees managing your party who have experience working with children. We suggest that parties be booked at least three weeks in advance. $100.00 deposit due with contract. Lunch available: hot dogs, chips, pizza, milk or juice for an extra fee. You may provide your own lunch. Call 847.491.1232 to reserve your party. Cancellation within 5 days of party will result in forfeiture of your deposit. There is a separate fee for the Balloon Man. We love to be creative and we'll make additional suggestions to you!